The Mercury-707 is a significant step up from the Mercury-607 in terms of optical quality and performance, with its larger 70mm multi-coated objective lens, and will provide more rewarding views of the Moon, stars, bright planets and other night sky objects. 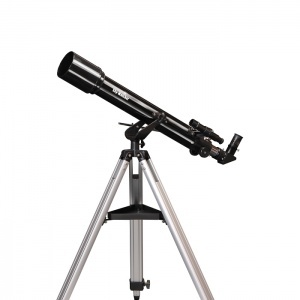 The telescope can be freely moved in both horizontal and vertical axes and is equipped with a micro-adjustment elevation control. An ordinary single lens brings different wavelengths of light to different focal points All Sky-Watcher Refractors are built with air-spaced two-element lenses, which reduce chromatic aberration more than standard doublet lenses.